The more time you spend getting to and from work, the less likely you are to be satisfied with life, says a new Waterloo study. Published in World Leisure Journal, the research reveals exactly why commuting is such a contentment killer—and surprisingly, traffic isn't the only reason to blame. "We found that the longer it takes someone to get to work, the lower their satisfaction with life in general," says Margo Hilbrecht, a professor in Applied Health Sciences and the associate director of research for the Canadian Index of Wellbeing. While commuting has long been thought to have some upsides, like providing time to unwind and transition from the workday, the new findings suggest the opposite is true for most people. The researchers analyzed data from Statistics Canada to better understand the links between commute time and well-being. They found that on top of being linked to lower life satisfaction, long commute lengths are related to an increased sense of time pressure. "Some people may enjoy a commute, but overall, longer travel time is linked to feelings of time crunch, which can increase stress levels," says Hilbrecht. Lengthy commutes have already been linked to poor mental and physical health, including hypertension, obesity, low-energy and illness-related work absences. 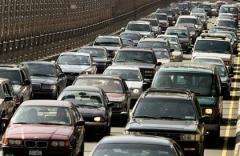 Beyond bad traffic, the researchers found one other factor to be highly correlated with commuters' life satisfaction: physical activity. "We learned that commuters who had time for physical leisure had higher life satisfaction," says Hilbrecht. "Physical activity can mitigate commuting-related stress if workers can include it in their daily routines, but the obvious constraint is time scarcity. Longer commutes mean less time for other activities, which leads to lower life satisfaction." Other factors linked to higher life satisfaction among commuters include flexible work hours and a higher household income. According to the study, women reported higher levels of time pressure, as did those with a partner. Hilbrecht hopes that the new findings will help contribute to the development of programs and policies to support better health. "The message to employers is that encouraging flexible work hours or providing time for physical leisure can pay dividends in their employees' satisfaction with life." Hillbrecht acknowledges that this may not be an easy sell, but stresses the importance of starting the conversation. "A long commute is detrimental to health. Maybe it's better to take a job that pays a little less money but is closer to home. If you have a choice, it's worth looking at the impact of the commute on well-being."